The thing I love about reading Chris Stewart’s books is that his portrayal of life in the Alpujarras rings so many bells with our life here. We do not shear sheep, and we are not ex-musicians, but his stories of interactions with his neighbours and daily challenges could happen here. Best in this book for me is the society of the title. The Spanish around here love to walk, early morning or evening in summer, mid-morning in winter, they walk along the country roads in groups or singly. An elderly man, his shirt and trousers neatly pressed, going for an afternoon walk. Two girls, dressed in brightly-coloured Lycra, power-walking briskly. A gaggle of village matrons, sauntering three and four abreast. Depending on the season, most are likely to carry a bag of some sort ready to forage what the countryside has to offer. 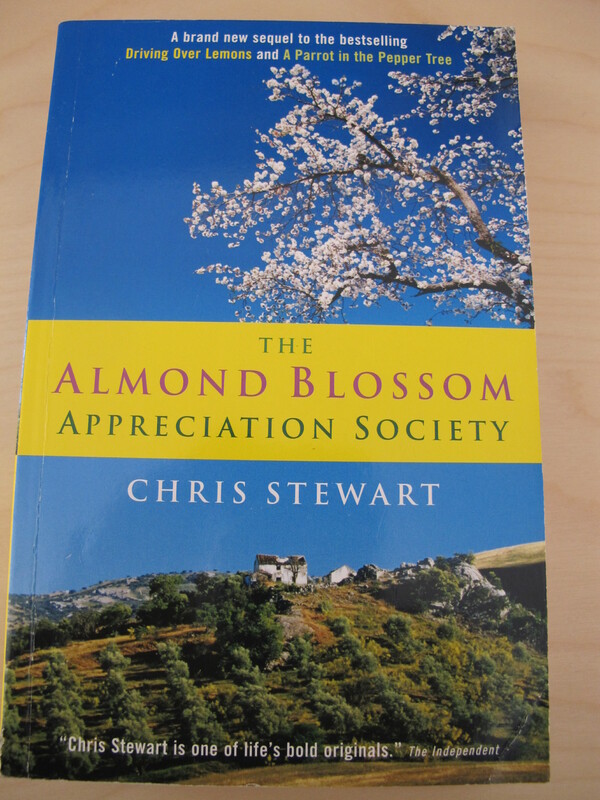 So the idea of a group of men walking up the hillside to look at the almond blossom sounds perfectly feasible to me. The only difference is that they would not drink wine from the bota but probably Zocco, a firey reddish aguadiente that is the favoured breakfast accompaniment to café solo in the ventas here. 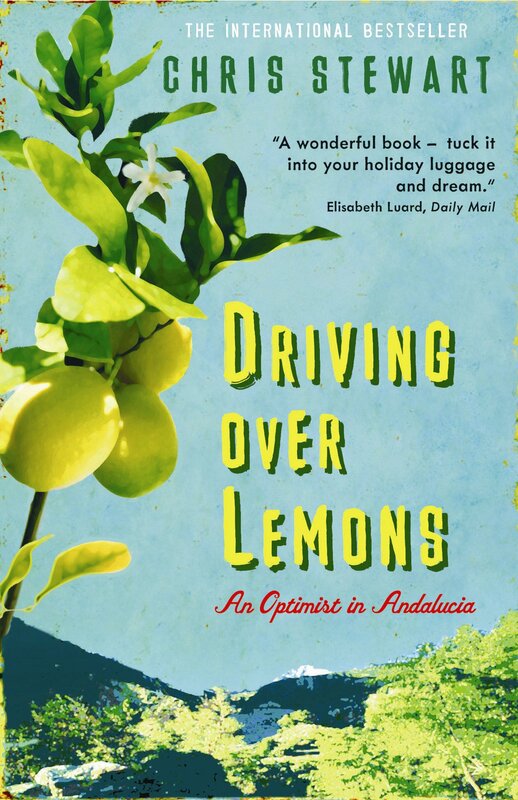 This entry was posted in Books about Spain and tagged Andalucia, books, Chris Stewart, living abroad, Sandra Danby, Spain, travel on December 7, 2013 by sandradan1. The second in Chris Stewart’s trilogy sees the Alpujarras home of the ex-Genesis drummer threatened by a dam being built in the valley. As we were once asked by a neighbour here for permission to site an electricity pylon on our land beside the river so that he could have mains electricity at his weekend cottage, I can identify with the turmoil. You move to a remote place purely for its beauty and tranquillity, then someone threatens it. Our neighbour thankfully agreed with us, and his wife, after a short discussion that solar power was the least impactful way of improving his electricity supply. As in the first book, Stewart’s tales of daily life with his neighbours are full of colour and character and make an easy read. 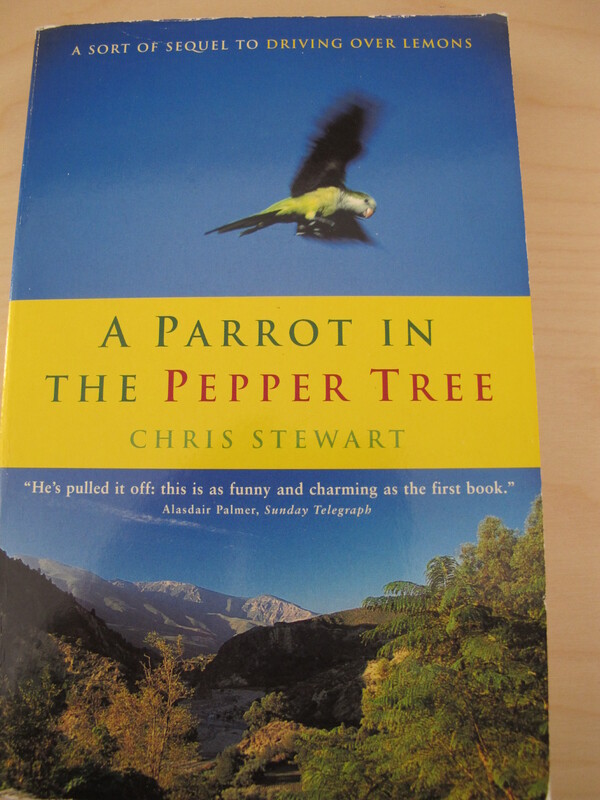 This entry was posted in Books about Spain and tagged A Parrot in the Pepper Tree, Alpujarras, Andalucia, books, Chris Stewart, Sandra Danby, Spain on September 21, 2013 by sandradan1. 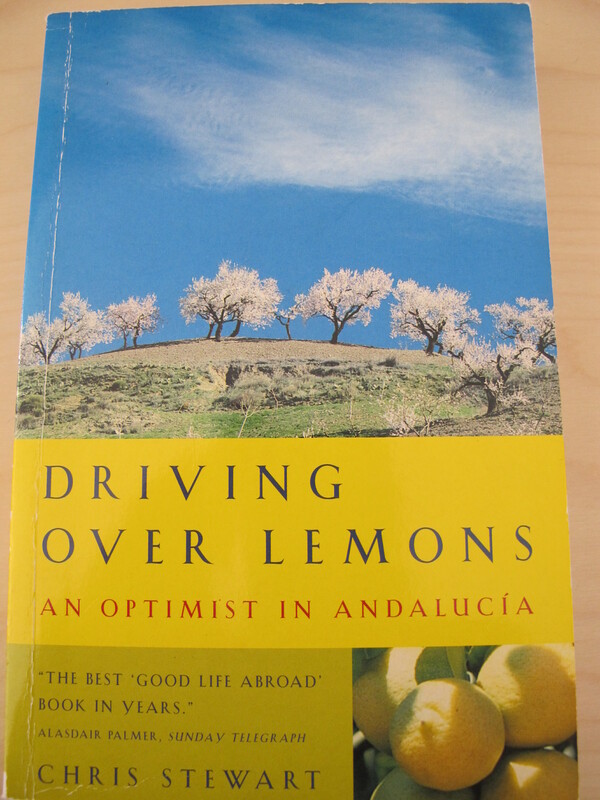 Driving Over Lemons by Chris Stewart is the big-daddy of ‘living in rural Andalucía’ books. Is there anyone who hasn’t heard of it? His description of watering his land, of knowing how water behaves and how to harness its life-giving properties, made me smile. His neighbour tells him he knows nothing about watering and Chris Stewart wonders if in 20 or 30 year he will have learned enough. We too have struggled with water control here, though while Chris builds sluices and irrigation ditches to water his crops, we have to deal with the run-off water which can run in torrents downhill from the olive groves above our house, threatening us with flood. Our English builder, when we first moved here, suggested building irrigation ditches to drain the water away, complete with pipes and enough concrete to build a house. But a friend of ours suggested hiring a digger for a day to cut ditches through the earth, leaving the soil piled up at the side. This was the Spanish solution: untidy but efficient and cheap. We never did get the ditches piped and concreted, the piles of earth are now covered with self-seeded shrubs and wildflowers. Every now and then the ditches are cleared again by digger, and we have not been flooded once. We, like Chris Stewart, have learned how to manage the watering. This is our old paperback copy [below]. 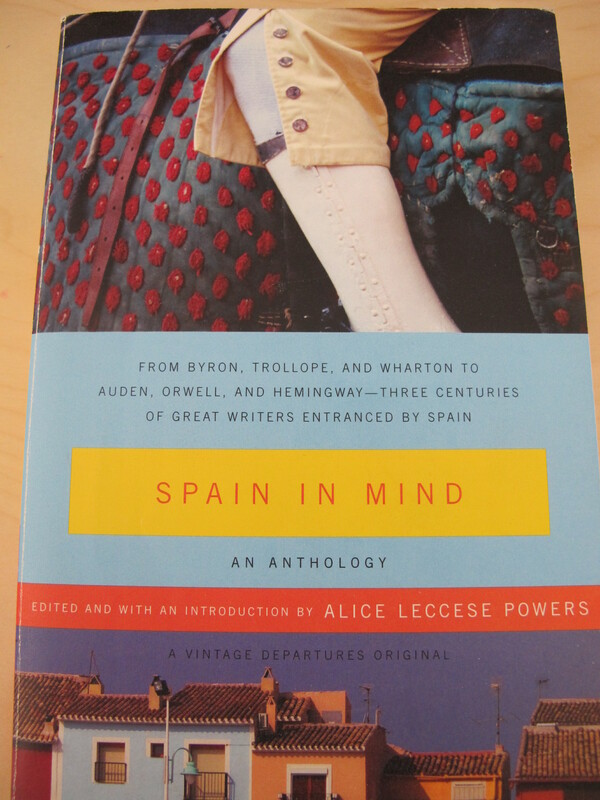 This entry was posted in Books about Spain and tagged Andalucia, books, Chris Stewart, Spain, spanish finca on August 21, 2013 by sandradan1.